Black Earth Farming is a Russian company that is listed on Nasdaq OMX Stockholm. Earlier this year the company announced that it had entered into an agreement to sell its Russian assets and liquidate the company. Yesterday the company received regulatory approval in Russia for the deal, removing the last potential obstacle to complete the transaction. Because of how the deal is structured there is some uncertainty about what the final payout will be, and that combined with the Russia factor probably explains why there is a decent spread left while the deal completion risk is almost completely gone. 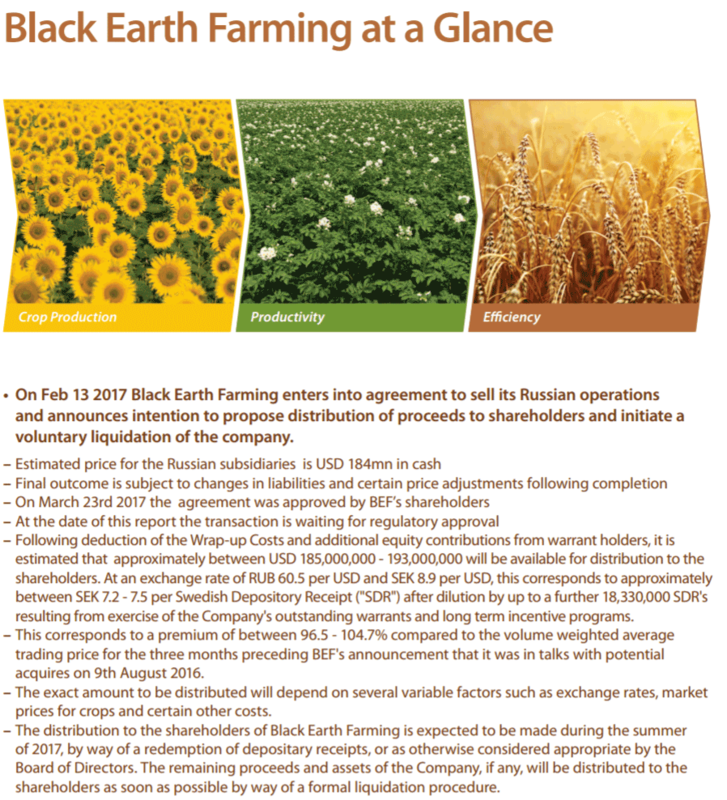 The acquiring party is not simply acquiring all shares of Black Earth Farming, but it is buying the operating subsidiaries in Russia for approximately $184 million. At the holding company level $46.9 million in debt will remain, and approximately $50 million of working capital as well. The company expects to incur $5 million in costs to wrap-up the liquidation, and there are some warrants outstanding that will presumably be exercised as well. These things make the picture more complicated, and some uncertainty is added by the fact that the final price will be adjusted based on the total amount of intragroup loans and “certain purchase price adjustments”. The company anticipates that between $185 million and $193 million will be available for distribution to shareholders. Simply taking the midpoint of this number is a reasonable guess in my opinion, because usually these estimates are slightly on the conservative side. The person making them has nothing to gain by overestimating those numbers, while if they are too optimistic they might get unhappy shareholders and/or lawsuits. If we take the midpoint of $189 million and divide this by 228.7 million of shares (this includes 18.3 million shares from the exercise of warrants and options) we get a per share amount of $0.826 or SEK 7.45. With the shares trading at SEK 7.00 this implies a spread of 6.4%. Not bad for a deal that is expected to close in May while the payment to shareholders is scheduled for late June. There is some risk that the payment will end up being lower, but I think that is mostly variance with a neutral expected value. It could just as easily end up higher than lower. There might also be a little bit of upside remaining after the initial distribution to shareholders. Black Earth Farming has earmarked $5 million for wrapping up the company, but if that amount proves to be too high (seems like a lot to me) the remaining cash will be distributed to shareholders as well. It will not be a lot, but I expect that it will be more than zero. Again, this is one of those things were underestimating the costs is only going to cause big troubles while picking an amount that is for sure sufficient has no real drawbacks. This entry was posted in Portfolio and tagged BEF-SDB.ST on April 13, 2017 by Alpha Vulture. Do you happen to know what the tax treatment would be from the liquidation of Black Earth for a U.S. based investor? What would happen if insiders just ran off with the money? Would they be punished at all? The board of directors and the management team is a fairly international mix of people, so presumably yes. And to be honest, I think that fear is a bit irrational. If you want to run off with the money, why don’t do it years earlier? Why put out press releases that the company is being sold? Why ask shareholders permission for the sale? Maybe I’m paranoid because i had this happen to me on an odd lot tender(AOBI). I can’t remember any details other than I believe it was in China. But since then I have participated in dozens of mergers in (mainly) China, but also a few in Russia and while not every single one was completed successfully nobody just run away with the cash. The whole merger thing is an expensive process with filings to complete, paperwork, lawyers, investment bankers etc. If you can just steal from the company it doesn’t make sense to do this expensive process. And in this case I’m not worried about it at all, this company appears to be more western than Russian despite the location of their assets. Hi Alpha, are there withholding taxes on the distribution? Im based in Europe, out of interest what do you expect to have to do tax wise? I would expect the distribution to be return of capital, without withholding taxes. A redemption of shares normally triggers withholding tax in Sweden. Might be different for SDRs but not sure. I’m just wondering how you find these kind of these transactions. And thanks for sharing them with the rest of us. Thanks for the write-up. Any thoughts on the currency exposure? Based on the company’s statements the purchase price seems to have been agreed in USD (the wording is not crystal clear). With working capital in RUB and bond debt in SEK, I am surprised the company has the confidence to announce such a narrow range of estimated SEK payouts. I might be wrong, but I think the range of SEK payouts is simply based on the range of expected proceeds in USD. So if FX rates change, the picture changes. Although in the latest annual report there is some language that the company is trying to hedge currency exposure in relation to the merger where possible, but my interpretation is that this is mostly related to for example cash and receivables in RUB and stuff like that. But of course, I could be wrong. Luckily it doesn’t matter too much right now since the difference between the SEK/USD at the time of the announcement and today is minimal. Is there a possibility of an SDR cancelation fee? In the US, ADR cancelation fees are pretty significant at e.g. 0.05$/ADR. If a similar fee would apply to the cancelation of SDRs, than we could be looking at a fee of 0.45 SEK / SDR. Section 3.2 from the 2009 prospectus states: ‘Ohman shall be entitled to compensation from the SDR Holders for the fees and costs which arise in conjuction with the deposit or withdrawel of Shares and/or issuance of SDRs as set forth in this section 3, in accordance with the price list applied by Ohman from time to time. Secondly, about the taxes; I have been looking through the 2009 prospectus (p. 80-86, p99-101) but can’t this statement ‘No Swedish withholding tax will be levied on dividend distributions’. “Ohman’s costs and fees for administration of the deposit account for Shares and the services rendered by Euroclear Sweden shall be the responsibility of the Company unless otherwise set forth in these Terms and Conditions”. So I think that probably there won’t be an SDR cancellation fee like you see with ADRs in the US, but I could be wrong. First time for me buying an SDR! Same here regarding SDRs..I e-mailed ohman. They probably won’t respond so perhaps I’ll phone them. I’ll let you know if I hear anything. I do agree that if such fees apply and when they are significant, either the company or the prospectus usually tells investors about them in more detail. And also, in Europe it’s more common to have lower share prices and higher share counts. So a fixed fee of $0.05/share is less reasonable than in the US where companies even get delisted from a stock exchange when the price is less than 1$/share. Did some further reading on the subject: can’t get a definitive answer from company documents. However, the (lack off) verbiage in company (and euroclear) documents, and the Euroclear document below with fee structures related to corporate actions for SDRs makes me believe its probably not an issue. in case you are taking a look: As you can see mostly flat fees, some fees are per VPC, which I think is the Swedish term for what is known as a ‘registered holder’ in the United states. I would expect that most holders hold through a bank/broker. These bank/brokers do have the option to register each client with shares separately in the VPC system, however they can also just register everything with 1 entry in name of the bank/broker. Hence I guess that is what most bank/brokers will do, as it also cost more money to have individual registered accounts. This leads me to believe that in either case (flat fee , or per VPC), cancelation fees will not influence the outcome much. Do you know what will happen with the outstanding bond ? Thanks for sharing. Do you have an idea of the impact of the change in USDRUB on the proceeds in USD? The ruble has been increasing in strength a bit compared to dollar since the announcement. Not very relevant. Transaction is in USD, only a bit of working capital might have RUB exposure (if it isn’t hedged, something the company intended to do).